For years, we’ve been asked when we were going to start making an orange bitters. Our thought was that there are already so many orange bitters out there that it really didn’t make sense to create another one. But… the idea of doing something with orange was still looming in our collective consciousness. We’ve really been less than satisfied with the orange bitters that are generally available, as so many orange bitters have burnt caramel in their base, giving them a very dark flavor. When we think of what an orange should taste like, we want something more like orange juice. Honestly, at home when we want orange bitters, we just use an orange twist paired with a complimentary bitter. 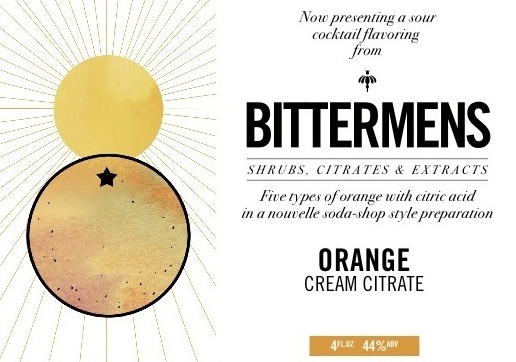 Maybe the answer wasn’t to do an orange bitter at all, but to do something orange that would pair with bitters in a cocktail. Instead of thinking about bitters, we started to explore the syrups and preparations used in soda shops, focusing on cream sodas and phosphates. Riffing on an orange cream soda syrup, we created a concentrated orange cream tincture and modified it with a heavy dose of citric acid (instead of using phosphoric acid like the soda jerks used to use). The result? The Orange Cream Citrate. Sweet, sour, tart and creamy, but not bitter by any sense. So, please don’t call this our Orange Bitters. If anything, it’s our orange anti-bitter.